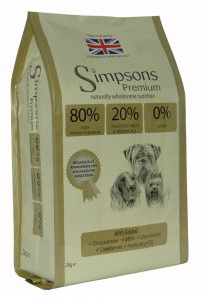 Simpsons is a relatively new brand, and entering a very packed market as it's competing in the 'Natural' Food shelves. 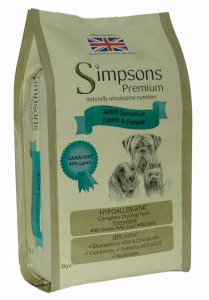 The Simpsons recipes fall neatly into the 'natural' pet food sector and although not the cheapest out there, this is good quality food. A little confusing to list the total meat content as a straight addition of dried meat, fresh meat and fat though in the example below. Expect to pay around £30 - £37 for a 12kg sack of their standard range and £55 for the 80;20 food. Lamb (min 45% - Dried Lamb, Deboned Lamb, Lamb Fat) Potato (min 26%) Beet Pulp, Brewers Yeast, Lamb Gravy, Dried Egg, Salmon Oil, Minerals, Linseeds, Vitamins, Yucca Extract, Cranberries, Nucleotides, Mannanoligosaccharides (MOS), Fructooligosaccharides (FOS), Glucosamine, MSM, Chondroitin. .